A newsletter headline caught my attention. It announced an upcoming “Spirit of the Salmon Immersion,” the PEC pre-conference organized with the tribes of the Columbia River. My eyes filled with tears. I immediately booked a flight to Portland, and I trusted that family, friends and finances would support a decision that was already made. Tears have always reflected the longings of my heart and I have learned to follow their flow. A month has now passed since the conference took place. I’ve been grateful for the space to reflect and integrate the Immersion experience before writing this article. Highlights included presentations by indigenous wisdom-keepers and scientists, field trips up the Gorge through forests still smoldering from the recent mega-fire, dining and dancing in the longhouse at Celilo village, ceremonies and celebrations at the River’s edge. I want to offer some inner reflections, triggered by the Spirit of the Salmon Immersion. These are offered as a counterpoint to the “Yang” of our western culture generally, and that of our Presbyterian tradition specifically, which honors plans and agendas, facts and figures, decisions and actions. We Presbyterians come to these retreats bearing a moniker “the Frozen Chosen.” But when exposed to teachings and experiences that touch our hearts, awaken our bodies, and satisfy our minds’ need to know, something in us begins to thaw. Maybe it’s the 2/3 of our bodies that are made up of water. In any case, two days of Immersion contributed to our feeling the flow of the River. Flowing waters aren’t sufficient to wash away the toxic legacy of the 500 year-old Doctrine of Discovery however. The Doctrine continues to perpetuate structural evil throughout the social, economic, and legal systems in our country. Broken treaties with the First Peoples of this land are just one manifestation of an insidious system of entitlement within our colonial/imperialist mentality and “settler consciousness.” The Doctrine is embedded at a subconscious level and thus pervades everything we do. In addition to gross inequities created by the Doctrine of Discovery, there are also vast differences in worldviews between First Peoples and those of us from a settler lineage. These differences help explain many cultural misunderstandings. They also explain why Earth’s natural systems are breaking down. Three worldviews presented by indigenous people at the Immersion will illustrate the point: Time, Place and Words. All these are foundational in describing Reality, and each one is key to understanding the crises Earth faces today. Let’s begin with Time. Indigenous wisdom says “Now” is the only access we have to our hearts, that all negative feelings are due to our focus on the past or the future, that “addiction” is a strategy to escape the present moment, and that we must not act from fear but instead stay in the heart-centered present moment. By contrast, we westerners live in a culture that is either mired in the past -- “Make America Great Again”-- or in the Future. We are obsessed by Time. “Time” is the most frequently used noun in the English language. Where can we start, immersed as we are in a powerful and time-obsessed culture that avoids the present moment? Finally, what about the indigenous perspective of Place, where the natural world is infused with significance, sentience and spirit; where every mountain in sight of your home has a story and you know your place in the center of things; where Mitakuya Oyasin – an acknowledgement of “All My Relations” is the way of greeting the whole community of life; the focus is on relationship, equity, respect, inclusion with all creation? In contrast, Western perspective is dominated by a colonial/imperial mindset that puts humans at the top of a tree of life, separate and special, having power over all else. As for the natural world? -- just “resources” to be used by us humans. (“You’ve seen one redwood tree, you’ve seen them all.”) No sentience ascribed to God’s creation, save in human form. What a set-up for a truncated existence, leading inevitably to an utterly devastated planet. But also: what a challenge for a community of people who call themselves “Presbyterians for Earth Care!” By incorporating deep wisdom shared by indigenous peoples, we can broaden our own worldviews and support one another in challenging the structures within our communities that enable the planet’s devastation to continue. Who can we look to as a model for action? Who else swims upstream in spite of impossible obstacles in order to return home to ensure the continuation of its own species and to give its body over to the whole community of life? 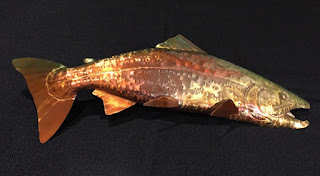 We can turn to the Spirit of Salmon for inspiration! Although the instinct for self-preservation runs strong in both our lineages, it’s the salmon who knows that its gifts must be returned to its home river. This is also the Hero’s Journey. And for those of us in the dominant culture responsible for Earth’s unraveling, returning home with our gifts may be the only hope we have. 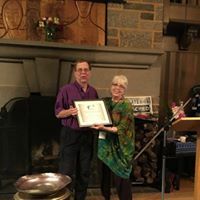 Presbyterians for Earth Care presented three annual awards to two individuals and a faith-based environmental organization in late September at its national conference, “Blessing the Waters of Life,” in the Columbia River Watershed near Portland, Oregon. The William Gibson Eco-Justice Award was presented to Dennis Testerman, long time Presbyterian and conservationist. 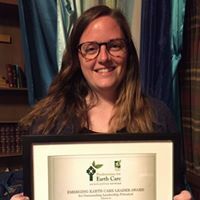 Lauren Wright Pittman, received the Emerging Earth Care Leader Award for a young adult, and Earth Ministry received the Restoring Creation Award for an organization. Read more about each of the award winners below. Dennis’ ministry of environmental stewardship has spanned more than three decades of chaplaincy, global and student missions and public service. He was a consultant to the Eco-justice Task Force of the PC(USA), whose report, "Restoring Creation for Ecology and Justice," was adopted by the General Assembly in 1990. (The report was written by William Gibson, for whom this award is named.) Since 2004, Dennis has served as the Stewardship of Creation Enabler with the Presbytery of Charlotte. Currently, Dennis is a novice with the Order of Ecumenical Franciscans. He is a fellow with both GreenFaith and the Natural Resources Leadership Institute at North Carolina State University and is certified as an environmental educator by the State of North Carolina. In the Seattle area, Earth Ministry (EM) engages people of faith in environmental advocacy, grounded in religious values. Now in its 25th year with 10 years of advocacy, EM trained 25,000 advocates over 7 years. 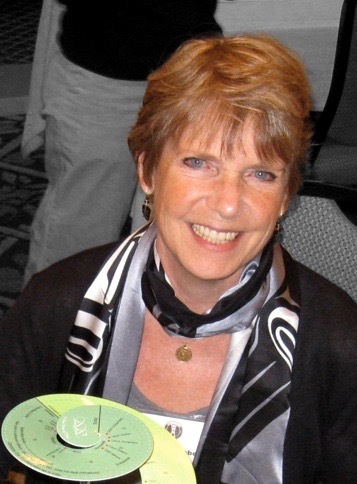 EM has been a force for toxics legislation; a constant moral voice against coal and oil extraction, transport and storage on the West Coast; and a listening, caring connection with tribal efforts. 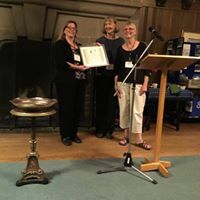 EM developed and administers its Greening Congregations program and hosts the Washington State Chapter of Interfaith Power and Light (IPL). Executive Director LeeAnn Berens is seen as a national leader in IPL and is frequently called upon to lead workshops at their national conferences.